1) Pre-heat oven to 190C / 375F / Gas Mark 5. 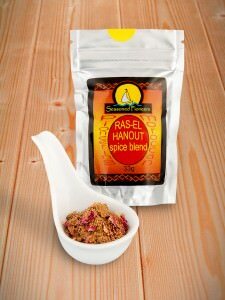 2) Rub the chicken breasts with ras-el-hanout spice blend and place in an ovenproof dish. When cooking you will need to cover the dish so ideally chose a dish with a lid – alternatively just use aluminium foil to cover the dish. 3) Sprinkle the chicken with the garlic, chickpeas and apricots. Pour over the tomatoes and 50ml / 2oz water and season with salt and pepper. 4) Cover with the dish and place in the oven to bake for 1 hour. 5) Sprinkle with chopped fresh coriander and serve hot with couscous or rice. Use a selection of vegetables – aubergine and mushrooms are a great choice – instead of the chicken add halloumi cheese for an interesting twist!